Wash your fish and put it on a dish that will go into your steamer basket. Cover and let steam for 20 minutes. While the fish is cooking, peel the ginger and finely chop it in julienne and set aside. Clean the green onions separate the white part of the green and cut them into thin julienne. Set aside. Clean and roughly cut the coriander and set aside. Once the fish is cooked, take it out of the steamer basket and gently remove the cooking liquid accumulated on the plate. 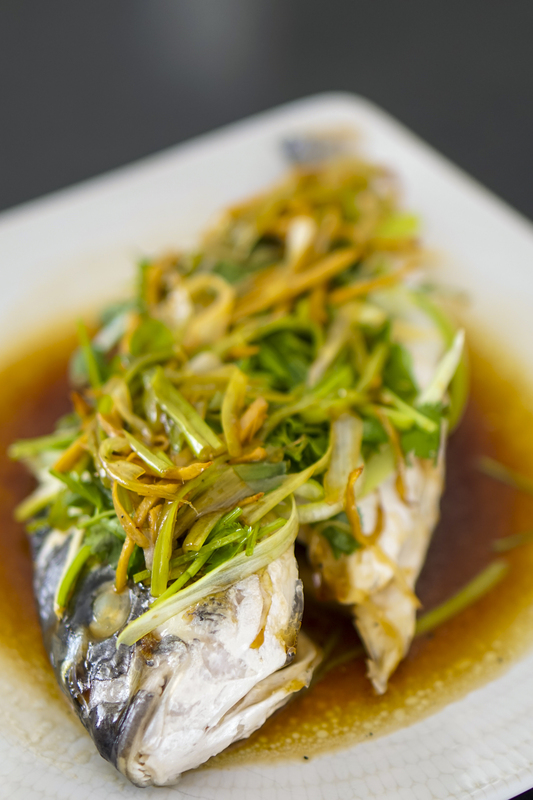 Spread over the cooked fish a tablespoon of ginger, coriander and the green part of the green onions and leave aside the time to prepare the sauce. In a saucepan heat the oil. Add the ginger and cook for 2 minutes. Then add water, soy sauce, sugar and pepper. Mix and cook for 2 minutes again. Add the white parts of the green onions and as soon as it starts to boil it’s ready. Pour all the sauce directly on your fish and serve our steamed fish wit ginger immediately with jasmine rice or other rice of your choice.